The weather in Boston was bitterly cold last week - the kind of cold that tempts you to give the fashion gods the metaphorical middle finger and plod about town in a Snuggie and some Uggs. Well, almost. Thankfully, there's an alternative in these bold, colorblocked winter coats. Best of all, every single one is on sale! Click on the links in the photo caption for details, and stay warm out there! wow- really nice coat. love the second one. No shame: I wore my Uggs all last week. But I also refused to ruin my leather shoes in the salt. So I just changed when I got to work :) But I could realllllly use that French Connection coat in my closet. On the coldest morning last week, my train didn't have any heat. After an hour of sitting and freezing, I had moved from miserable to pre-Hulk. 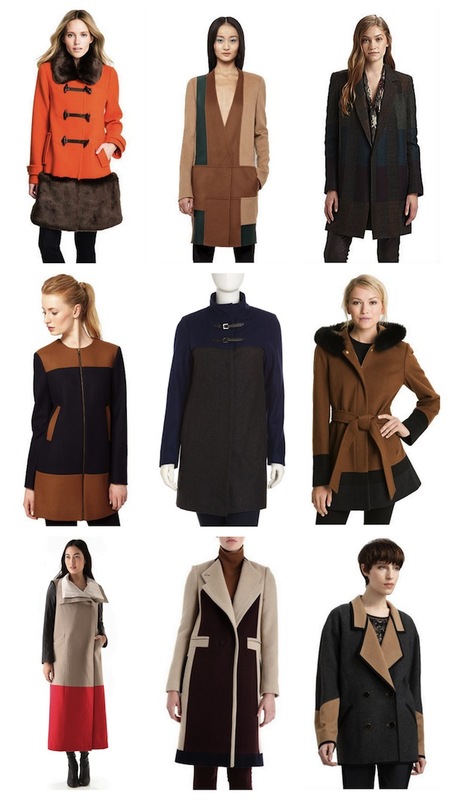 The point being, cold weather is bad for everyone and we should all buy these beautiful coats to stay warm and happy. Impeccable taste! I tried to pick a fave...if I was forced at gunpoint to decide, I might say the Mason - bottom left. These are great! I haven't really noticed color block coats on people. I like anything that gets us away from a sea of black winter coats.